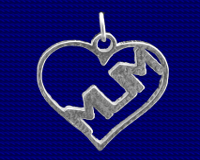 Craftsman made Sterling silver Mum in Heart charm. I made the model for this charm using a 3D printer ! Approx. size 21mm x 21mm.